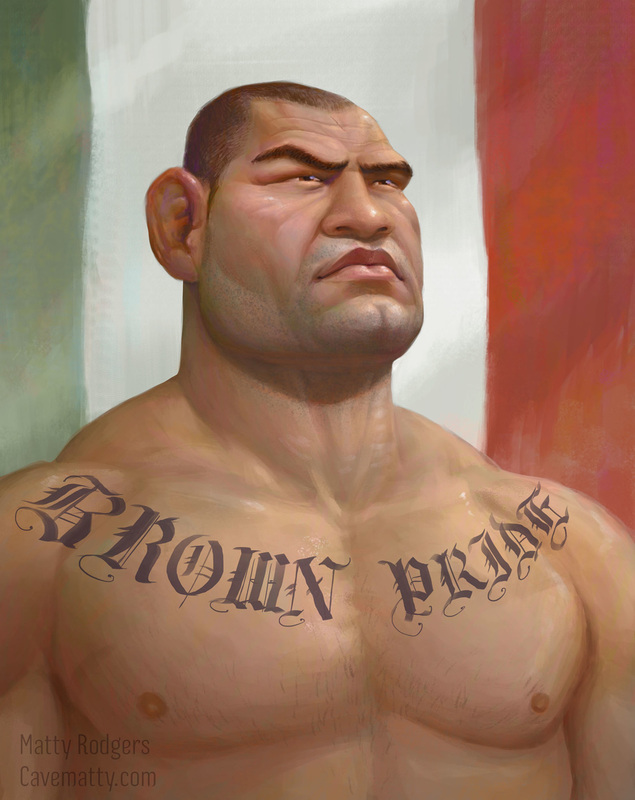 Here's one of 'Cardio' Cain Velasquez. He has a great look with the feel of a predator, something in the rounded lines of his face making me think of a bull terrier or a shark. Despite his distinct look and intimidating face he was really tricky to capture. He has many strong features; the cauliflower ears, the scar tissue around the brows, the strong jaw, a rounded feeling to the bones of the skull. Yet these features are shared by other fighters, especially those in the heavier weight classes. I couldn't really find any one feature that defined him, and exaggerating too much often looked good but it quickly began to look like another fighter. Ultimately this one ended up closer to a straight portrait because of the difficulties I had. I'm happy though, because I believe I captured the likeness and that predator feeling!